String Institute (SI) provides classes that focus on developing technique, musicality, note reading, and ensemble playing. In addition, a variety of enrichment classes are designed to broaden our students’ institute experience. 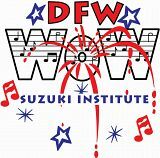 Participating in family-fun activities like Faculty Fun Recital, Family Contra Dance, and Pajama Play-in round out each exciting day at DFW WOW.